When Nietzsche dubbed Richard Wagner "the most enthusiastic mimomaniac" ever to exist, he was objecting to a hollowness he felt in the music, a crowding out of any true dramatic impulse by extravagant poses and constant nervous movements. Mary Ann Smart suspects that Nietzsche may have seen and heard more than he realized. In Mimomania she takes his accusation as an invitation to listen to Wagner's music—and that of several of his near-contemporaries—for the way it serves to intensify the visible and the enacted. As Smart demonstrates, this productive fusion of music and movement often arises when music forsakes the autonomy so prized by the Romantics to function mimetically, underlining the sighs of a Bellini heroine, for instance, or the authoritarian footsteps of a Verdi baritone. Mimomania tracks such effects through readings of operas by Auber, Bellini, Meyerbeer, Verdi, and Wagner. Listening for gestural music, we find resemblance in unexpected places: between the overwrought scenes of supplication in French melodrama of the 1820s and a cluster of late Verdi arias that end with the soprano falling to her knees, or between the mute heroine of Auber’s La Muette de Portici and the solemn, almost theological pantomimic tableaux Wagner builds around characters such as Sieglinde or Kundry. 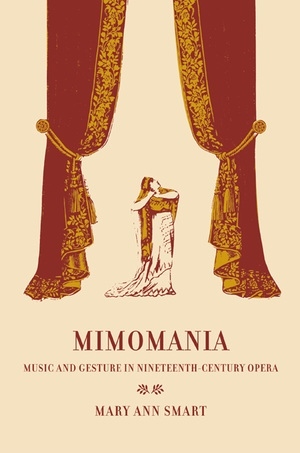 Mimomania shows how attention to gesture suggests a new approach to the representation of gender in this repertoire, replacing aural analogies for voyeurism and objectification with a more specifically musical sense of how music can surround, propel, and animate the body on stage. Mary Ann Smart is Associate Professor in the Music Department at the University of California, Berkeley. She is the editor of Siren Songs: Representations of Gender and Sexuality in Opera (2000) and coeditor of Reading Critics Reading: Opera and Ballet Criticism in France from the Revolution to 1848 (2001).